Renewing before the end of March will enter you in to our annual Prize Draw for a Day at Bedford Autodrome courtesy of MSV. And don’t forget our monthly prize draw to win an item of Teamwear. We are working on more benefits for all of our members and will advise these as they become available. Don’t forget you can still benefit from reduced parking, fast track passes and lounge access at some airports using code BMMC2018. As we have already advised AWS unfortunately has ceased trading – we thank Nick and all of his team for their unstinting support. AWS have also helped us move to Lille workwear and they are almost up and running. There will be some changes to the previous offering but we believe we have agreed a good deal and look forward to working with Lille going forward. We mustn’t forget our all important sponsors who enable us to subsidise the cost of overalls and waterproofs. NGK, MGCC, Tiga cars, Polyflor have been long term supporters – and we thank them for their continued support. Cataclean have agreed their support this year and extended this to the winners of our National awards – we wish Dan Rowbottom all the best as he moves in to BTCC for 2019. 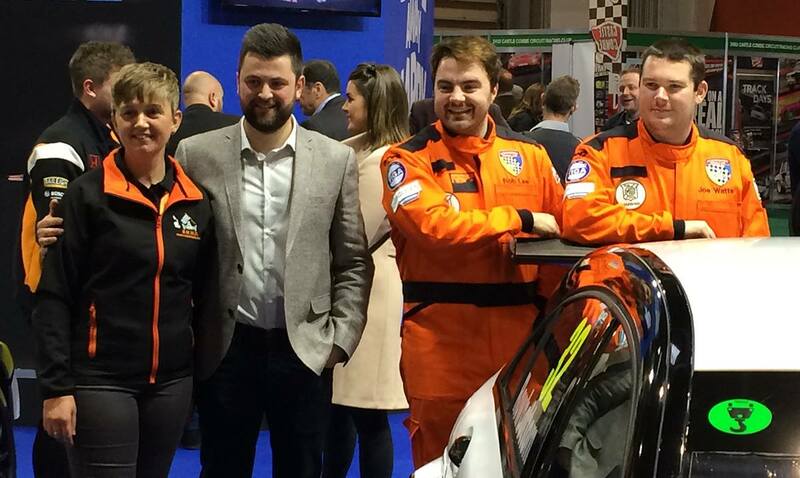 Our new sponsor Ginetta helped us with a fantastic launch at Autosport International last month and we thank them for their fabulous support. I understand not everyone requires overalls and waterproofs but these benefits are for the vast majority of members. However if there’s other kit that we should be looking to get sponsored let us know! So I have “covered” membership, clothing and benefits but don’t forget we support your training, grading and volunteering too. Training season is upon us so get yourself signed up to attend – contact your local training officer. Don’t forget to get your PRC signed! Any questions or issues with grading contact your local grading officer. Motorsport UK are updating resources on their website with their new logo. (https://www.motorsportuk.org/Resource-Centre/Marshals). You will find useful documents here – these are in the process of being reviewed so changes may be forthcoming. And we intend to link or put directly on our website where appropriate. Finally it’s our first Council meeting of the year this weekend – we welcome new members to the group and look forward to bringing new ideas to improve the club going forward. Why not make sure your ideas are heard? Contact your local committee to offer assistance or ask for help. Or please contact me directly – would love to hear what we can do to make our life in Orange better for all!